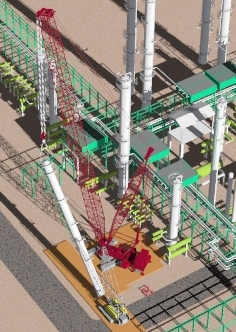 LiftPlanner is a 3D crane and rigging planning software. LiftPlanner is custom made to include the cranes in your fleet. LiftPlanner includes programs for creating elements in the lift environment. Vessels, exchangers, towers, steel, supports, lugs, trunions, chokers, shackles, lifting beams and piping can be created with this system. Drawings are created to plan and document your critical lifts. LiftPlanner works with AutoCAD 2013 to 2020 or BricsCAD version 16/17/18/19 and Windows. Available in metric or Imperial units. Pre-built 3D models of the user's crane fleet. Many different routines to manipulate the cranes. A program to retrieve the load chart for the crane. Warnings for two blocking and angle limits. 275 pre-built chokers with weight and rating data. Program to sum rigging weights. A shackle library, 6 through 700 ton. Vessel, beam, column & piping creator programs.